If you have ever wondered how to make lotion, this post is for you! 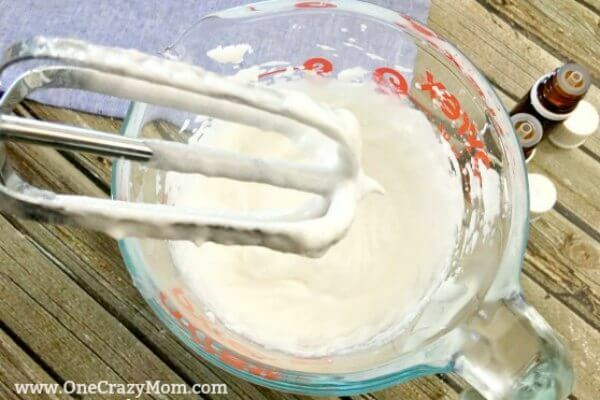 This simple DIY lotion is very easy to make and works great to restore moisture to dry skin. 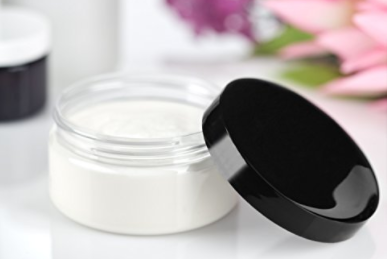 No worries about what all you are putting on your skin with this all natural homemade lotion. We really struggle with dry skin. My daughter especially gets terrible dry skin all year round. Whether it is in the Summer or in the middle of Winter, we get tons of crazy dry patches. Regular body lotion just didn’t cut it and I didn’t like the idea of rubbing crazy medicated creams on her. Plus, has anyone noticed how expensive lotion is these days? Goodness some of those tiny tubes of lotion come with a hefty price tag!!! I knew there had to be another solution so I started experimenting with homemade lotion. We have made DIY Body Scrub and Honey Body Wash and loved it so I thought we could give this easy homemade lotion a try. We are trying to implement more and more all natural products into our home. It can be overwhelming so I just focus on one item a at time. I have learned in life that if I try to do it all at once, I will get frustrated. However, if I tackle my goals into bite size pieces that are more readily obtainable it’s so much easier! Plus, it’s so satisfying to mark it off my list and move on to something else the next week. Please tell me I’m not the only that gets overwhelmed with my to do list? 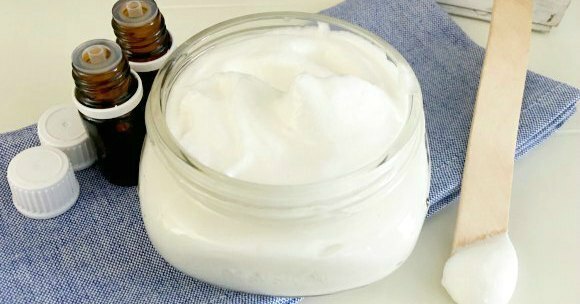 You can also make DIY Face Moisturizer with ONLY 2 ingredients! Your skin will feel wonderful! This week my goal is to learn how do you make a lotion from scratch? By just focusing on one product, I don’t get overwhelmed. Plus, this homemade lotion recipe is so simple to make and requires so few ingredients you won’t ever buy store bought again! One week we focused on All Natural Cocoa Body Lotion and the next was The Best Natural Dandruff Shampoo. Slowly but surely we are working out way to all natural and actually knowing what is in our products! I feel so much better using all of these things on my kids. It’s a great feeling knowing and being able to pronounce all of the ingredients! I finally made this DIY lotion and it works perfectly. We use it every single day right after shower or bath time and the dry patches stopped popping up. 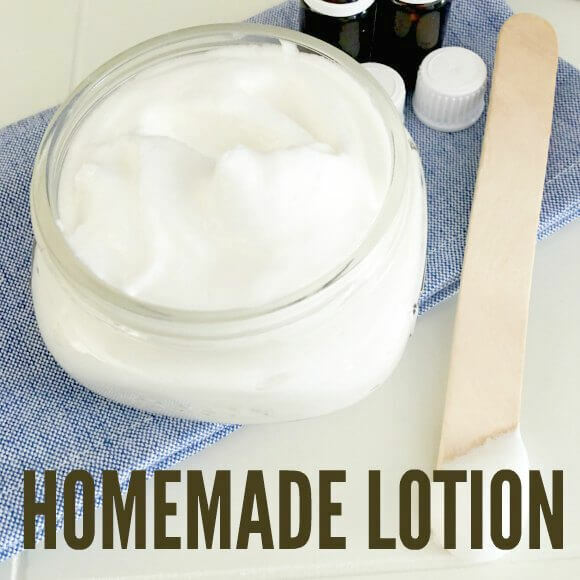 I know some people make a thicker homemade body lotion for summer and a lighter homemade body lotion for winter but this homemade lotion recipe seems to work for all seasons! 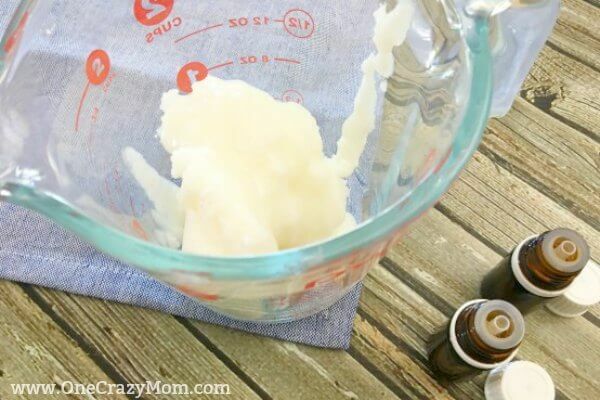 This is a natural body lotion that is super easy to make. You really just need three ingredients for this homemade body lotion. You can’t get any easier than that, right? 2. 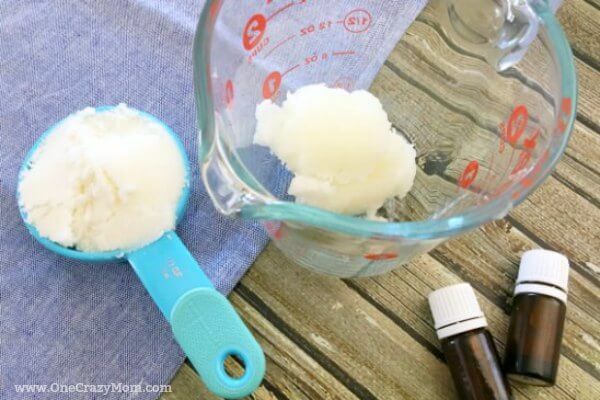 Mix in your room temperature coconut oil (should be in a solid or soft state, not melted) with a hand or stand mixer for about 15 minutes until light and fluffy. Any mixer will do but I have a KitchenAid stand mixer that comes in so handy. 3. Now mix in your essential oils. We love lavender essential oil in ours. It will smell amazing. 4. Transfer to an 8oz mason jar. Now I only made an 8 oz mason jar worth when I first made it. However, now that I love it I mix up huge batches of it. I will triple or quadruple it and pour it into 3 or 4 8 oz mason jars. That way I have several made up with just one mess. It takes no more effort to make several. 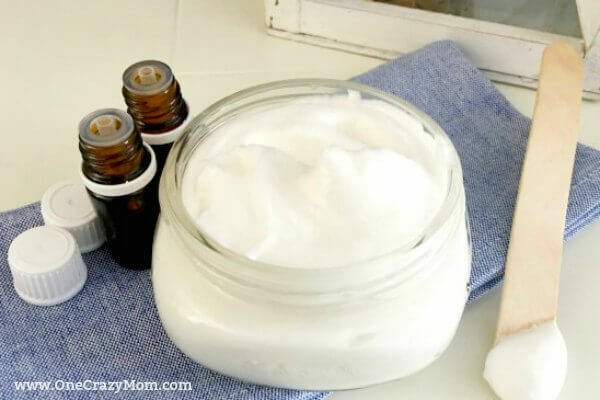 Everyone always asks how do you make homemade lotion? So we started giving jars of this homemade body lotion as gifts. They really make amazing and practical gifts for people. We have given them at Christmas time and we have given them as fun teacher gifts. You can also give them out for birthday gifts and more! Everyone loves how great it smells. We love using lavender essential oil. It’s so calming and it smells amazing. I bet you could experiment with other oils but we just love lavender. Essential Oils are just amazing and we use them for all sorts of things around here. I love these 6 Amazing Essential Oil Blends for Allergies! I love to keep a small jar in my purse for dry hands. I use these smaller jars here that are so easy to just pop into my purse. This smaller size is also great for traveling! That way I can keep my large jar at home and just use this small one for on the go! So handy! It’s perfect to grab for dry elbows or hands and just dab a little and go! Now that you know how to make your own body lotion, are you going to try it? I promise if we can do it, you can too! I think you will love this homemade body lotion once you start making it. I bet you will never buy store bought lotion again. Whether you have sensitive skin, or just want a good natural body lotion make sure you make this easy recipe. The shea butter makes it so soft and just leaves your skin feeling so nourished and moisturized. Sometimes, I also add a little vitamin e oil. We just love homemade body lotion with coconut oil and these other moisturizing ingredients. If you prefer almond oil, there is a Luxurious Homemade Lotion recipe that uses almond oil. I can’t wait to finally get rid of my dry skin! 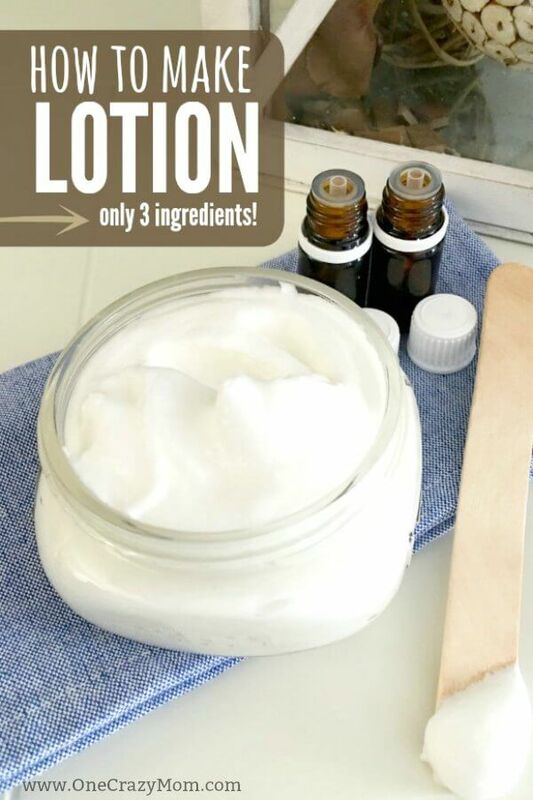 Let us know how you like this homemade lotion! It has truly changed things around here. I know that sounds sort of crazy but it really has. When my kid’s have severely dry skin, it makes them sort of cranky. They have trouble sleeping because they are tossing and turning from their skin feeling “itchy” as they call it. They wake up sleep deprived and the cycle just starts all over. Now, everyone sleeps so good and the lavender in the lotion has such a calming effect. Do you know how to make makeup remover? It’s also very simple and works amazing! I don’t know about you but my hands stay so dry all year. This easy DIY hand cream does the trick and keeps hands well moisturized. I do not even understand how I stopped up here, but I assumed this submit was good. I tried this recipe and I love it. I can’t believe what a difference it’s made in my skin-all over. Thanks so much for sharing. Is there a shelf life with the finished product? Sarah – 3-6 month. Thank you! Your easy description of making this hand lotion sounds so easy and makes a great gift idea. I will order things in bulk wanting to make a large quantity. I love the use of lavender oil. This will bring joy into my life. I loved this recipe of making this beautiful lotion. I have a homeless foundation for veterans. This is would be great for the homeless. Thank you so much for sharing this recipe! Please keep more recipes coming. Love this and it sounds so easy! Where do you get the shea butter? michaels, or joanns Fabric, or any craft store near u.
I am looking forward to trying this, recipe, ty, you make it so easy to follow. I am excited! Where do you buy Shea butter.? Cosmetic store or drug store ? How much essential oil do i put in it? I make mine with a little less coconut oil. I melt the shea butter and coconut oil then put in the refrigerator for about 30 minutes. Then I whip it with the mixer and add the essential oil. I make this for my grandson that gets really bad dry spots on his back. I also make another batch for my son inlaw for his hands because he is a mechanic and has sensitive skin. I add 1 tablespoon of cornstarch for him because he doesnt like it greasy.. We live in Arizona and only put this on at night or we would burn super super bad in the sun. I have had more people tell me my hand and cuticle look and feel awesome and I am 52. This is awesome. I will try your way. How do you store the extra jars of lotion?Do you refrigerate them and how long do they last? Hi where do you find plain Shea butter. Health food store sells it or order online. Amazon, health food stores, etc… the best I’ve found is on Amazon. It’s an raw shea butter and it comes in a 16 oz. Container. African raw shea butter is the best. I love it. Hi, many thanks for you post. I got some ideas on what to mix with my shea butter from it. Do you have to use the lavender? No you can use any of the essential oils as long as they are the theraputic grade. For summertime lime is a nice blend. You could use any essential oil you choose, based on needs and preferences. Can you substitute another oil for the coconut oil? I appreciate this post, I’m definitely going to try this. Both my kids have eczema and the stuff that works is so expensive. Its like the industry knows how much people who suffer with eczema need it and take advantage. So when this works, I will be eternally grateful. Made it, it’s great! I used vanilla with the lavender and I love the way it smells! Thanks for the recipe! Sounds easy enough, can’t wait to try it! I’ve made this and it’s amazing thanks for sharing the recipe! I will definitely make this, the weather is making my skin so dry and I need this moisture. Is this too thick to use in a squeeze bottle? What’s the best way to store the lotion? Will a closet shelf be alright. Am going to try another essential oil, lavender makes me sneeze.. Thanks for the lotion Receipe. What is the best way to store it? Is there something I can add to it to make it not so greasy? Carla – I store it in a air tight glass container. If yours is greasy, maybe try using less coconut oil or trying a different oil (olive oil or almond oil). Coconut oil has a low absorption rate so it can feel greasy at times. Hello, how long can this product be kept for ? I just tried this and it eventually turned out great. 15 minutes isn’t really long enough. I needed to let it rest and cool before it became light and fluffy. I added 5 drops of tea tree oil, 5 drops of Frankincense, and a smidge of vitamin E oil. Love it! I love it, going to try make it. Any suggestions, I like aloe and my skin loves it. There is any chance that I can get something with aloe Vera ? I’m unfortunately allergic to shea butter, and it is in EVERYTHING nowadays. Do you have any alternatives for this ingredient? I think you could use coconut butter. I haven’t tried it before but I bet it would work great! Let me know how it turns out! Can you use a pump style container? Haley – I’m not sure. I have never put in a pump container. It’s pretty thick so I’m not sure that it was work so well.